Color: Comes in a variety but most commonly "honey" colored - yellow, gold, red or brown. Appearance: Transparent, sometimes with fossilized insects. Hardness: 2.5. You could scratch it with a nail. Other Notable Qualities: Amber is actually a resin, not a gemstone. It's also often created synthetically. 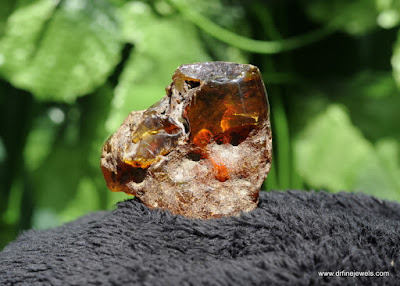 Real amber will have a sweet smell to it and can be scratched with a nail or melted with a hot needle. 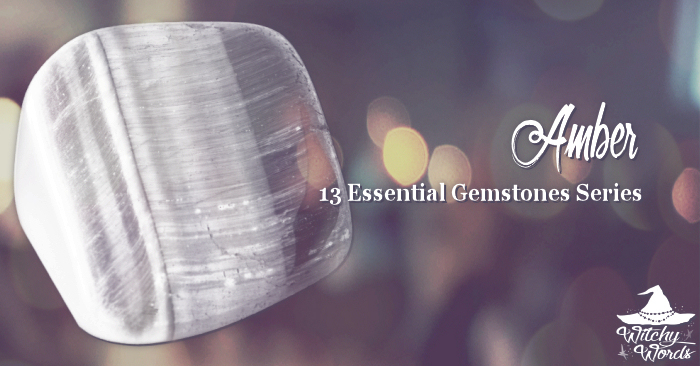 Unlike other stones in this series, amber is not actually a crystal. Instead, it is fossilized resin - not the interior sap but the sticky substance trees emit to seal a wounded area. While most decay over time, resign in the right oxidation and polymerization conditions forms the valuable stone we know today. Because amber is fossilized tree resin, we associate this stone with earth. Often, amber includes fossilized creatures fully intact and forever immortalized through the resin. 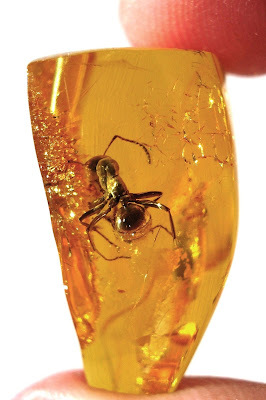 A variety of animals ranging from frogs to lizards and components such as snake skin and bird or dinosaur feathers have been preserved in amber. The honey-colored fossil is also known to contain bugs like flies, ants, beetles, moths, spiders, bees and more. Ancient Egyptians considered amber a gem of the grieving and lonely because they felt it represented the tears of Ra in its drop-like shape and because it contained such insects and animals. Amber would be placed in tombs and used in funeral rites. Each individual animal preserved in amber can alter the direct meaning of the stone, but the fact that so many animals have often lost their lives to this substance qualifies it to be associated with death and the spirit world. Greek philosopher Thales of Miletus noted that, when rubbed with silk, amber wold spark, attracting dust and feathers. This force was called electricity based on the Greek word elektron, and literally translates to "amber." 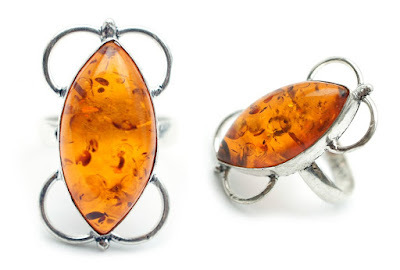 Electricity was thought to be unique to amber from when it was discovered in 600 BCE all the way to the 16th century. Because the electricity would attract dust and feathers, amber was used as a dusting and lint-rolling tool in days past. In this context, amber attracts and beckons. Finally, ancient Egyptians and Romans alike would use amber to protect. Ancient Egyptians associated amber with children and often gave them amulets to protect them. Romans would give amber to gladiators and it was used in the netting between said gladiators and the audience to keep the spectators safe. This combined with the scientific fact that resin was meant to protect and heal tree wounds means that amber exhibits qualities of protection. Amber has been highly prized throughout history, causing it to be imitated in a number of ways. In modernity, the plastic era created a means by which imitators could strongly mimic realistic-looking amber. This substance, known as "bakelite," began being sold in Europe in the early 1920s. 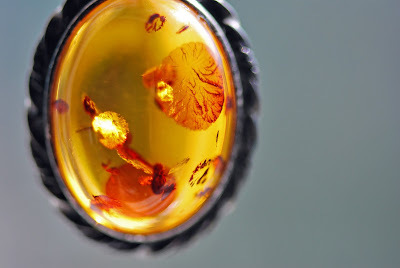 The popularity of Jurassic Park created a secondary rise in the need for imitation amber with inclusions like bugs and feathers. These amber pieces may even have lumps of plastic that resemble the "crust" that forms on natural amber, and imitators will even go as far as to dip these pieces in oil that smells like the resin. Fortunately, tests for real amber exist. True amber typically smells like pine resin, is surprisingly warm to the touch and very easy to scratch with a knife or nail. While plastic might stick to a needle, true amber will chip off in a powdery-like substance. Real amber will also float in salt water! As you can tell, amber has caused us to get very creative in our ability to mimic the stone. 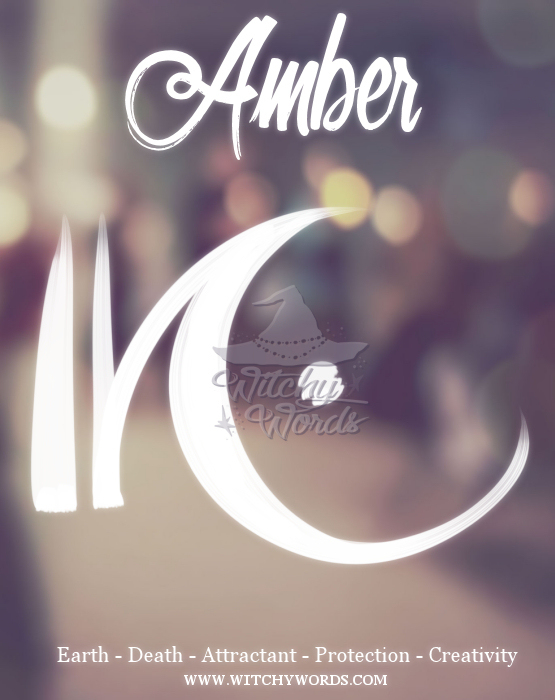 Utilize this sigil as a way of invoking the properties of amber if you have none available to you. You are welcome to print this sigil, place it in a grimoire, use it on a spell or put it in your blog with proper credit. Do not claim this sigil as your own. Amber is beautiful. I got a chunk of it this summer and also a ring. Nice to know what it stands for. Did you create the sigil yourself?